If you've been a MinerBumping reader for a while, you might recall hearing the name "Capt Lynch". He's had a grudge against the New Order for quite some time now. 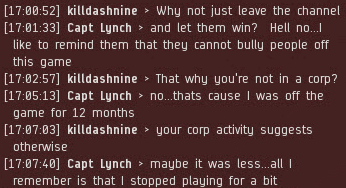 Lynch is also a relatively unstable element in the great melting pot that is the highsec community. Even so, the New Order has tried to lend a hand, whenever possible. 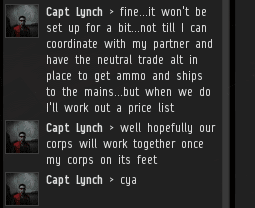 Some months ago, Capt Lynch changed loyalties for the Nth time and purchased 1 billion isk worth of New Order shares. In the meantime, Lynch switched his allegiance to the rebellion at least a few times. It's not clear what events Lynch was referring to in his chat with killdashnine, but then again, I haven't followed the Lynch saga very closely. Whether the "hair dryer" incident or "al quaeeda" incident actually occurred, I leave to the judgment of the reader. Lynch and the truth are not the best of friends. To be generous, they're acquaintances who can't quite remember each other's names. 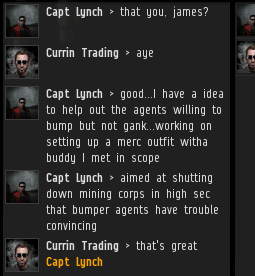 As I was enforcing the Code with my ganker alt, I was contacted by Capt Lynch. He had a Ledrian-esque plan to create a pro-Order mercenary outfit to prove his loyalty to the New Order. 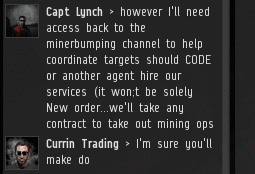 The plan had been jeopardized by the fact that Lynch had recently gotten himself banned from the MinerBumping channel. His offense was going down the list of the channel participants and setting them all to "Terrible" standings (each time sending them a notification of it). That didn't win him any friends. I wished Lynch the best of luck in coordinating with the New Order without the benefit of having access to the channel. I wasn't exactly prepared to roll out the red carpet for him. He would need to work from the outside. As the situation developed, however, a disturbing report about Lynch came from the Haatomo system. A friend of Agent D400 spotted Lynch flying a massively anti-tanked Mammoth. Worse yet, he'd gone AFK with it. A clearer violation of the Code there could not be. The conclusion: Lynch had switched sides again. Jade Korinta, the witness to the crime, had no choice but to gank Lynch. 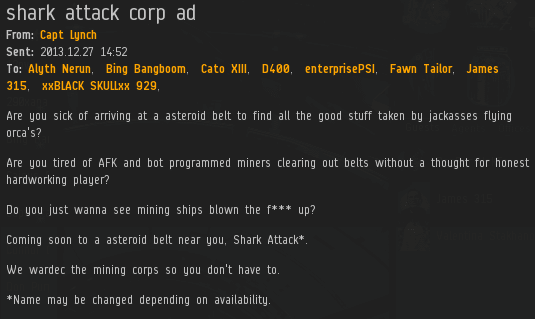 Let this be a lesson to all who would play both sides in highsec. You can talk the talk--you can even donate isk--but at the end of the day, your actions will reveal where your heart is. I am confident that some day Lynch will give his loyalty permanently to the Code. Until then, he goes AFK at his own peril. 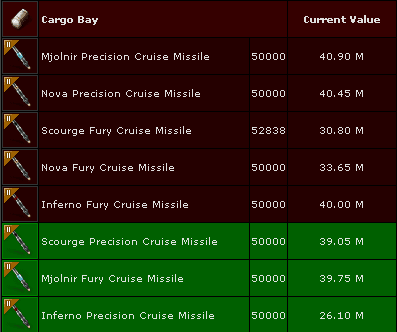 In all, nearly 300 million isk went up in smoke. The contraband gave new meaning to the phrase "giev missl or bump". As a former member of Sharks with Frickin' Laser Beams(FRICK) corp, I take exception to his use of the Shark name. As a member of the human race and user of the English language, I also take exception to sharing these demographics with Capt Lynch. 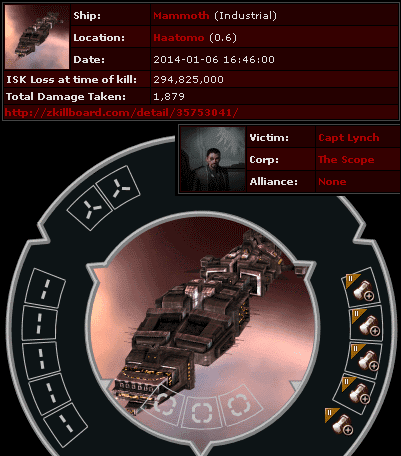 Lets compare: Lynch's fit with all skills a V: 23,165 cargo hold, 2598 EHP. An unfitted Hoarder with all skills at 0 has a 41,000 ammo bay, 4444 EHP. With identical skills the Hoarder has the faster sublight speed and quicker align time. Also the Hoarder has more room for tank modules and/or warp speed rigs because cargo expanders do nothing. In short, even Lynch's choice of ship was a mistake. 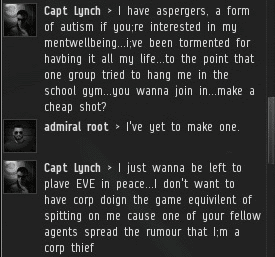 Capt Lynch claims to have a friend, so I call b.s. on his new plan from the outset. 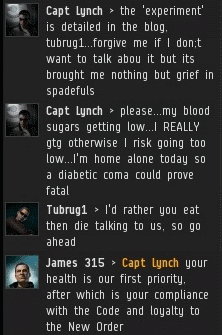 "Tubrug> I'd rather you eat then die talking to us" - Dude, death wishes aren't cool. I may be one of the few who noticed this issue, but at the beginning, when he's talking about all his conditions, he implies he is diabetic and doesn't want a low blood sugar because it may cause a diabetic coma.....except diabetic comas come from having a WAY TOO HIGH blood sugar. Hypoglycemia is what people with low blood sugar get. You're one of the few who made your particular mistake, that much is true. "Diabetic coma is a reversible form of coma found in people with diabetes mellitus. It is a medical emergency. Hyperosmolar nonketotic coma in which extreme hyperglycemia and dehydration alone are sufficient to cause unconsciousness." "In most medical contexts, the term diabetic coma refers to the diagnostical dilemma posed when a physician is confronted with an unconscious patient about whom nothing is known except that he has diabetes"
It is, of course,possible to have a patient who's unconscious, has diabetes, but is unconscious for a reason which is not any of the above three. This happened to my father, and the paramedics misdiagnosed him as being in a hypoglycemic coma, when it was actually the much more serious systemic inflammatory response syndrome; which they really should have been able to distinguish between. What do people get who haven't had enough Rum? I'm not suffering from that condition right now, but I was earlier today and it was awful. "What do people get who haven't had enough Rum?" If they're smart, they go get some Rum. I have failed you diabeetus. All my medical training differentiated between hypoglycemia and diabetic coma pretty specifically. It is possible to have hypoglycemia and not be in a diabetic coma, and it's possible to have a diabetic coma and not be hypoglycemic; so the problem isn't that your training differentiated between them "pretty specifically", but that your training should have differentiated between them "very specifically", as well as noting their overlaps. Then you would have avoided being wrong on the intarwebz. I think he needs a wardec.